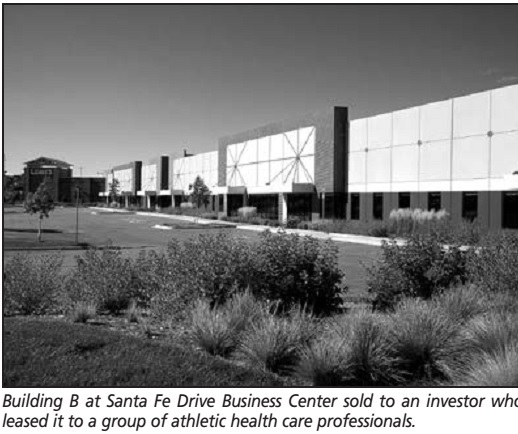 A group of “elite” athletic health care professionals will locate within a building in a Littleton industrial park that is just about out of inventory. Blue Wing Capital Management LLC bought a vacant 17,193-square-foot office/warehouse at Santa Fe Drive Business Center from Prime West Development and Orix Capital. The buyer executed a seven-year master lease with the health care group to create a holistic wellness center with a wide range of patient treatment options, as well as strength conditioning, yoga and education. “This vacant shell offered the opportunity to design and build an integrated facility addressing the unique needs of the varied practitioners,” said Peter Shaw, managing member of Blue Wing Capital. “My partners and I are proud to help bring this valuable community resource to the city of Littleton and greater south metro area.” Blue Wing Capital Management is a boutique real estate investment firm that specializes in value-add and opportunistic commercial and multifamily property investments. Shaw, who lives in the area, said most of his investments have been out-of-state and he was pleased to find an opportunistic deal close to home. “I like the local nature of the asset and the quality of construction,” he added. Blue Wing Capital paid $1.29 million, or $75.50 per sf, for the building, which is located at 4925 S. Santa Fe Drive and is known as Building B. The acquisition was made through a single-purpose limited liability company. Avery Construction Services Inc. will complete tenant improvements over a 20-week period. Occupancy is slated for April. Santa Fe Drive Business Center is a five-building industrial condominium development at the northwest corner of South Santa Fe Drive and West Belleview Avenue, just north of Lowe’s, that was completed in 2008. The building Blue Wing Capital bought has never been occupied. It is the fourth building in the park to sell. The last available building, Building A, is under contract to a user. “There is a severe shortage of quality industrial product for sale in the market today, evidenced by us going under contract and closing on our remaining two buildings at the Santa Fe Drive Business Center in the past 30 days,” said Cassidy Turley broker Tyler Smith. “It just shows how tight the market is getting. If there’s a viable option out there, it’s getting gobbled up.” Smith, along with Cassidy Turley brokers R.C. Myles and Craig Myles, represented the sellers in the transaction.